Alejandra Rojas intercepted a pass with 22 seconds left to seal the win for the Spartans, who clinched the Northwest League title with the win. Haylee Nerio had six tackles, a sack and two interceptions for Cimarron. Lee finished with seven catches for 77 yards, and Del Rosario completed 21 of 33 passes for 161 yards and two TDs with two interceptions. Natasha Obradovic added a 10-yard TD catch for the Spartans, who got nine tackles and a sack from Jasmine Reiter, and eight tackles and a sack from Makenzie Clark. Chaparral 26, Western 25 — At Western, I’asia Mack threw two touchdown passes and ran for another score as the Cowboys edged the Warriors. Western scored a touchdown with 40 seconds remaining and decided to go for a 2-point conversion, but the Chaparral defense made the stop. K.K. Millsap ran for 160 yards and a touchdown on 15 carries, and Vanessa Sanchez ran for a score and caught a touchdown pass for the Cowboys. Centennial 12, Arbor View 0 — At Centennial, Dominique Dorsey led the defense with two interceptions as the Bulldogs blanked the Aggies. Centennial’s Shania Brathwaite had a rushing touchdown, and Brianna Norton had one receiving touchdown for the Bulldogs. Sierra Vista 39, Desert Oasis 19 — At Desert Oasis, Jamie Kalaau-Sunia had three interceptions and had three touchdown receptions as she led the Mountain Lions to a victory over the Diamondbacks. 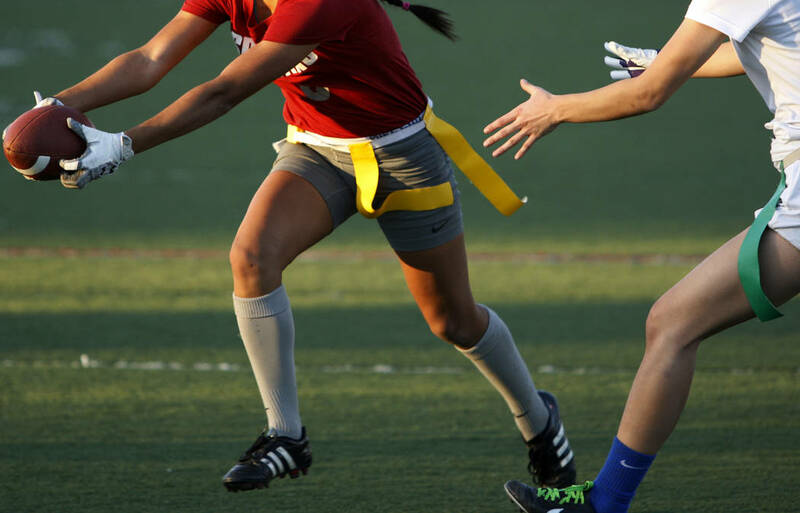 Kalaau-Sunia returned one of her interceptions 80 yards for a touchdown. Aaliyah Medina passed for 215 yards for Sierra Vista. Desert Oasis’ Makayla Rickard rushed for 97 yards and a touchdown and threw two TD passes, but was intercepted five times. Jaid Raval caught two passes for 100 yards and two scores for the Diamondbacks. Silverado 20, Spring Valley 6 — At Silverado, Kennedy Power rushed for 144 yards and a touchdown on 11 carries as the Skyhawks downed the Grizzlies. Silverado’s Katie Mulligan completed 15 of 26 passes for 140 yards and threw one touchdown pass each to Kathleen Fonua and Sydni Bishop. Virgin Valley 45, Mojave 0 — At Mojave, the Bulldogs racked up 383 rushing yards to defeat the Rattlers. Julia Ramirez rushed for 131 yards and three TDs on 12 carries to lead Virgin Valley. Shaylee Feltner added 107 yards and a touchdown on seven carries, and Ally Wright rushed for 76 yards on nine carries for the Bulldogs. Wright completed 11 of 23 passes for 128 yards and two touchdowns. Taylor Marshall and Autumn Boatright each had a TD catch for Virgin Valley. Del Sol 33, Valley 7 — At Valley, Stephanie Tewart threw five touchdown passes to lead the Dragons by the Vikings. Tewart completed 13 of 25 passes for 181 yards. Kaitlin Harrah caught two touchdown passes, and Paris Genovese, Janeth Varela and Katierae Patriquin each hauled in one touchdown pass for Del Sol. Clark 48, Durango 26 — At Clark, Jagayra Gomes passed for 353 yards and six touchdowns as the Chargers topped the Trailblazers. Gomes completed 15 of 23 passes and also rushed for 105 yards and a score on seven carries. Jaeda Centeno caught six passes for 171 yards and four TDs, and Valeria Morquecho had three catches for 105 yards and two scores for Clark. Durango’s Jaden Brown ran for 146 yards and a touchdown on 11 carries. Tatiana Baes ran for 124 yards and a touchdown on 15 carries, and Dezirae Castillo caught three passes for 108 yards and a touchdown for the Trailblazers. Palo Verde 25, Bonanza 19 — At Palo Verde, the Panthers held off the Bengals. Bonanza’s Cindylou Rasiang completed 29 of 51 passes for 294 yards and two touchdowns and ran for a score. Ashley Vasquez and Shayne Dunn each hauled in a touchdown pass for Bonanza. Sunrise Mountain 33, Boulder City 12 — At Sunrise Mountain, the Miners scored 21 second-half points to defeat the Eagles.